Hyperventilation is a common response in fish exposed to elevated water CO2. It is believed to lessen the respiratory acidosis associated with hypercapnia by lowering arterial PCO2, but the contribution of hyperventilation to blood acid–base compensation has yet to be quantified. Hyperventilation may also increase the flux of irons across the gill epithelium and the cost of osmoregulation, owing to the osmo-respiratory compromise. 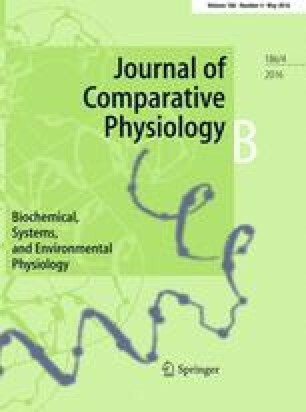 Therefore, hypercapnia exposed fish may increase standard metabolic rate (SMR) leaving less energy for physiological functions such as foraging, migration, growth and reproduction. Here we show that gill ventilation, blood PCO2 and total blood [CO2] increased in red drum (Sciaenops ocellatus) exposed to 1000 and 5000 µatm water CO2, and that blood PCO2 and total blood [CO2] decrease in fish during hypoxia induced hyperventilation. Based on these results we estimate the ventilatory contributions to total acid–base compensation in 1000 and 5000 µatm water CO2. We find that S. ocellatus only utilize a portion of its ventilatory capacity to reduce the acid–base disturbance in 1000 µatm water CO2. SMR was unaffected by both salinity and hypercapnia exposure indicating that the cost of osmoregulation is small relative to SMR, and that the lack of increased ventilation in 1000 µatm water CO2 despite the capacity to do so is not due to an energetic tradeoff between acid–base balance and osmoregulation. Therefore, while ocean acidification may impact ventilatory parameters, there will be little impact on the overall energy budget of S. ocellatus. Financial support for this work was provided by a Natural Science Foundation grant to AJE (EF 1315290).